The show season is starting again, with our first show this week in Redondo Beach, CA, July 29-31, 2011. Since I will have less time to write about the interesting things happening in the antiques world, I will be posting new blog entries once or twice a week — Mondays and Thursdays. If you don’t see a new post on Thursday, it’s because I was too busy, so look for a new one the following Monday. The Redondo Beach Antiques Show isn’t big. It’s more like a boutique show — small, but high quality. I’d like to think I’m one of the high quality dealers who will be exhibiting there. The show opens to the public this Friday at 11 AM, and continues until 5 PM on Sunday. It’s surely worth a visit if you live anywhere in the greater Los Angeles area. I’ve spent the last several months scouring the country and the world buying some extraordinary antiques. I’ll have them on exhibit for the first time at the Redondo Beach show this weekend. Tops in the lamp category is a really fine Tiffany 20″ diameter Arrowroot table lamp, with great color. In addition, I’m bringing a great assortment of fresh to the market Tiffany, Handel and Pairpoint puffy lamps. 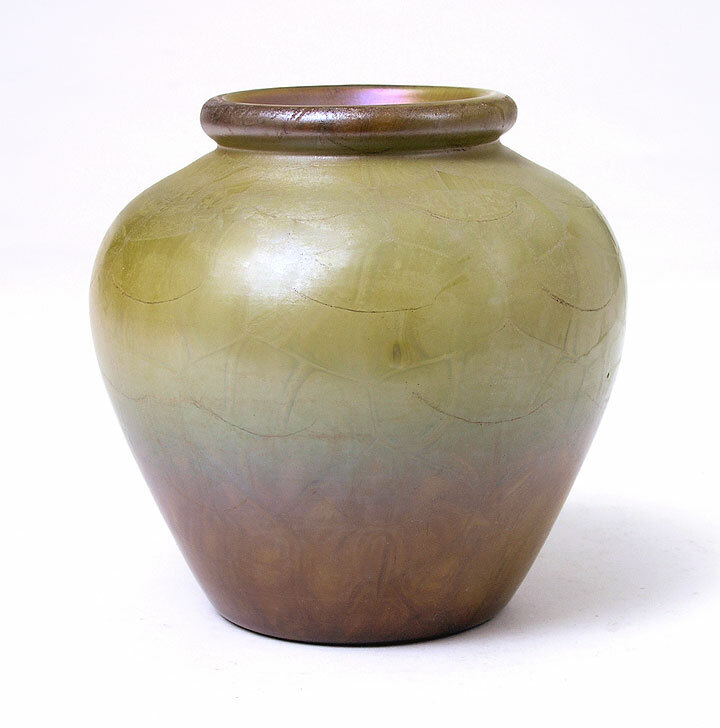 In American glass, I’m bringing some great items, including a fabulous Tiffany Studios Favrile Agate vase — very rare and very fine. For French glass, I’m bringing fabulous Daum Nancy and Gallé vases, including two exceptional Daum examples with very rare and sophisticated mushroom decoration. 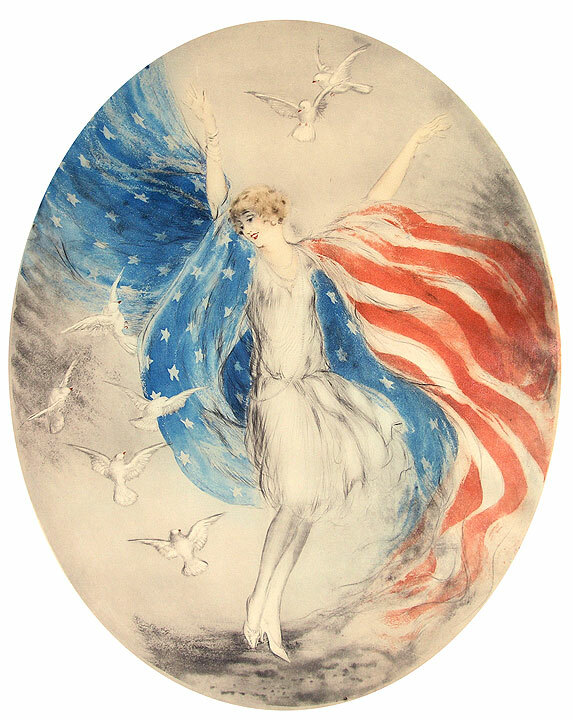 In addition, I’ll have the usual fabulous assortment of original Louis Icart etchings, great American art pottery with fine examples by George Ohr, Van Briggle and Rookwood. Make the time to visit me at the show, and I’ll show you some great antiques that you’ll love. 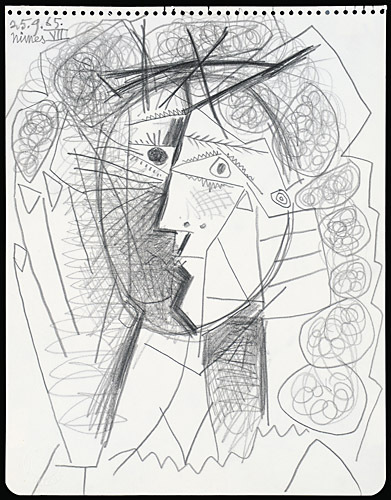 Like original Picasso art? Just take it (and get arrested). The show season is starting again, with our first show in Redondo Beach, CA, July 29-31, 2011. Since I will have less time to write about the interesting things happening in the antiques world, I will be posting new blog entries once or twice a week — Mondays and Thursdays. If you don’t see a new post on Thursday, it’s because I was too busy, so look for a new one the following Monday. Mark Lugo of Hoboken, NJ, has very good taste. He likes fine wine and good art. The problem was that he didn’t have the money to pay for it, so he just took what he liked. 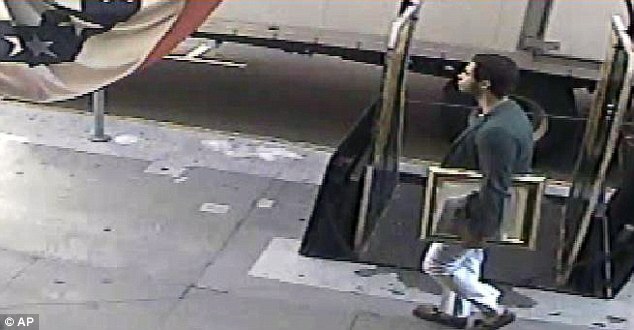 Lugo was arrested in San Francisco on July 6, 2011, a day after allegedly stealing a 1965 Picasso drawing, “Tete de Femme” from the Weinstein Gallery on Union St. in San Francisco. His modus operandi was to calmly remove art from the wall of a gallery or hotel, walk out, and then take a taxi. In the San Francisco theft, he was caught on video in a taxi, at his hotel and at a nearby restaurant. Mark Lugo with the suspected stolen Picasso. Photo courtesy of AP. Using tapes from previous robberies, the police were able to obtain a search warrant for his apartment in Hoboken, NJ, where 11 other stolen artworks were recovered. The most valuable of the stolen works ($350,000) was a 1917 Fernand Léger India ink composition on linen, “Composition aux Elements Mécaniques (Composition of Mechanical Elements). It was on loan to the Carlyle Hotel in NYC, where it was hanging on the wall in the lobby. Lugo supposedly removed the work from the wall and calmly walked out of the hotel on the morning of Jun 29, 2011. 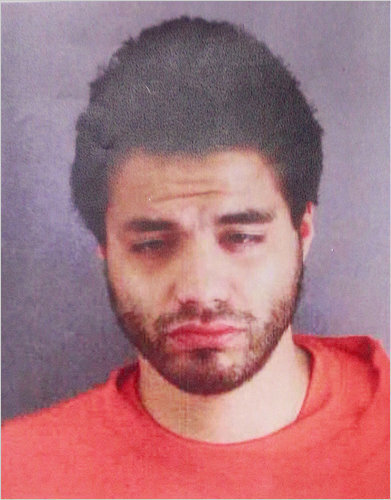 All of Lugo’s suspected thefts occurred within a relatively short period of about four weeks. Picasso "Tete de Femme". Photo courtesy of Weinstein Gallery. To top it off, Lugo, who had been a sommelier at fine New York restaurants, like BLT Fish, was also suspected of stealing three bottles of very expensive wine, Château Pétrus Pomerol, from Gary’s Wines in Wayne, N.J. At $2,000 a bottle, that’s really fine wine. In no surprise, the wine has not been recovered. Now that’s funny. On Friday, July 15, 2011, in a San Francisco court, Lugo pleaded not guilty to stealing the Picasso from the Weinstein Gallery. Judge Samuel Feng denied his request to reduce his bail from $5 million to $2 million, citing that the defendant “posed a threat to public safety and local business owners”. He will remain incarcerated until his next court appearance, scheduled for August 23, 2011. Lots of interesting things have been happening in the antiques world recently. Since I have a bit more time to write about them during the spring and summer, I will be posting new blog entries twice a week, instead of once — Mondays and Thursdays for the next few weeks. So make sure you come back often and tell your friends about my blog! 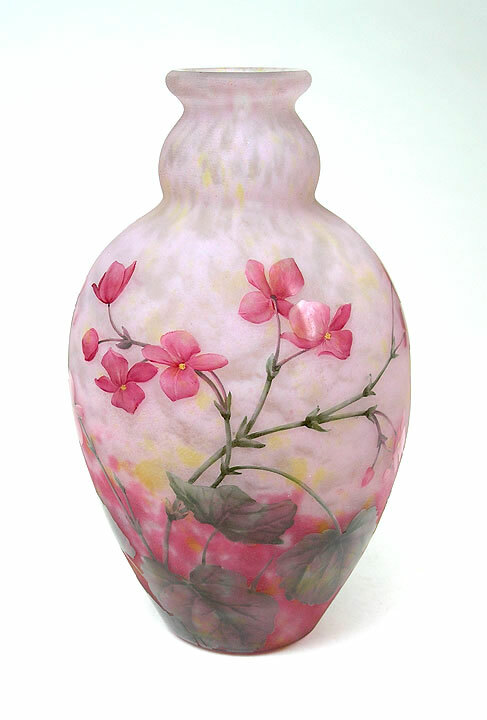 The Daum Brothers produced cameo glass in Nancy, France, starting in the 1880s. By the turn of the century, they were turning out masterpieces. Some of the most beautiful examples utilized the techniques of acid-etching, followed by hand-painted enameling and firing. Some of the vases, especially scenic examples, were wonderful. 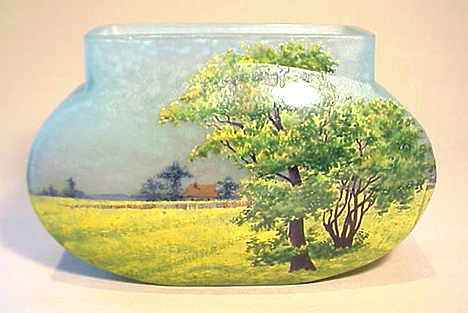 One of my favorite vases had a farm scene painted with bright yellow. I’m not sure what crop was growing, but it must have been a beautiful sight to behold in person. I haven’t seen or owned another example of this scene since this one, about 15 years ago. Daum produced vases with decorations of each of the seasons. Naturally, the fall scenes were the most colorful (and therefore the most desirable in today’s market). One distinctive box had particularly bright color (the colors vary from example to example) and beautiful detail. 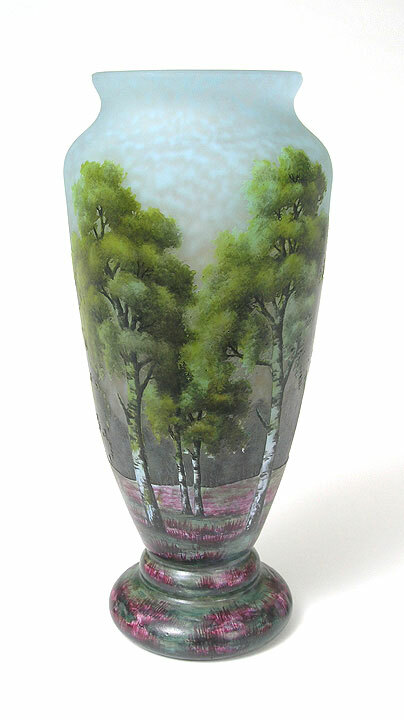 The example pictured above is not your typical summer scenic vase. The birch trees were exquisitely painted with leaves in multiple shades of green. The artistry was so fine, the trees looked alive. The artist for this vase was especially talented. 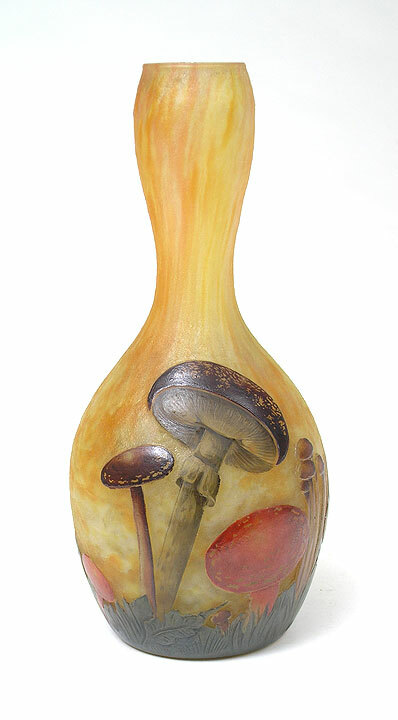 The unusual colors, the fabulous detail, the depth, all worked together to create a stunning vase. Not all of my best vases were in the past. I’ve got some special ones for sale right now that will be included in a future blog. Please take a look by clicking on the following link. Daum Nancy glass for sale. Skinner’s held their European Furniture & Decorative Arts sale on Saturday, July 9, 2011. In among the diverse offerings were two lots by the Martin Bros. of London & Southall, England. Works by the Martin Brothers have been popular and highly sought after for decades. What’s interesting is that the earlier items from the 1870s and 1880s are fairly undesirable in today’s market. Why, you may ask? Because they’re not “grotesque” — a big compliment in the world of Martinware. Early stoneware items were, for lack of a better word, ordinary. They mostly depicted realistic looking flowers and birds. At some point in the mid to late 1880s, the brothers started producing wares that were strange and zany with fantastic creatures. They also created bird tobacco jars with wonderfully eccentric faces. These are the types of grotesque items that today’s collectors eagerly seek. 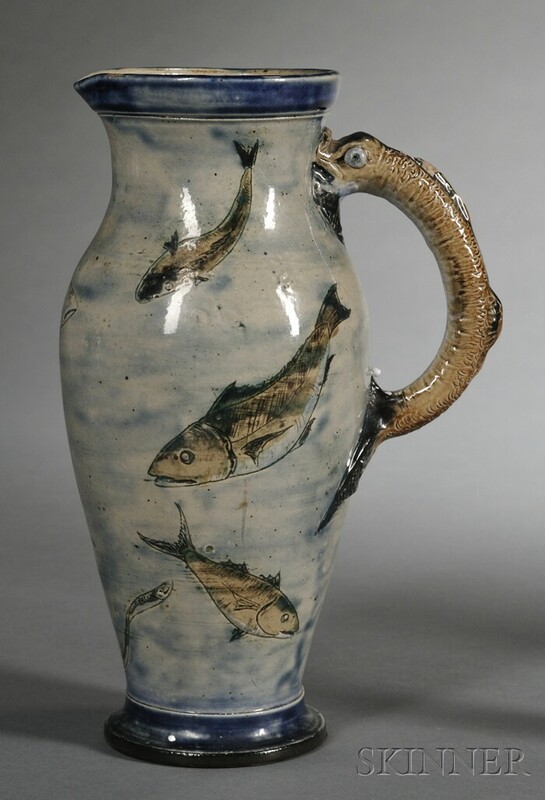 Skinner’s lot #64 was a Martin Bros. ewer from 1884, with fish decoration. The decoration shows the direction that they would begin to take a few years later. In this example, the fish are realistically depicted. As a result, I assumed the lot would not do well, but it did. Realistically estimated to sell for $2,500 – $3,500, it reached $4,148, including buyer’s premium. 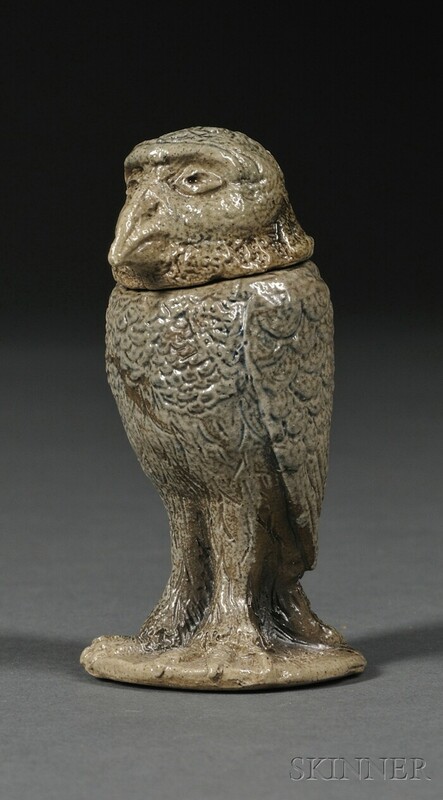 The next lot, #65, was a rare miniature bird tobacco jar, with removable head, only 3½” tall. It more than quadrupled it’s pre-sale estimate of $1,200 – $1,800, to sell for $9,480, including buyer’s premium — impressive for such a tiny example, but not surprising. For the complete results of the auction, click on the following link. Skinner’s Decorative Arts results. Over the years, I’ve had many opportunities to buy limited edition etchings, lithographs, etc., by big name artists like Marc Chagall, Salvador Dalí, and Pablo Picasso. I was always concerned about reproductions that I knew existed (and were even rampant). I didn’t have the knowledge to tell the difference, so I always avoided them. Reproductions of Louis Icart etchings also existed, but in that world I’m an expert, so I’ve dealt in them for over 30 years. Now comes news of the arrest, conviction and sentencing of one of the main culprits in the world of limited editions art — Michael Zabrin of Northbrook, Illinois. 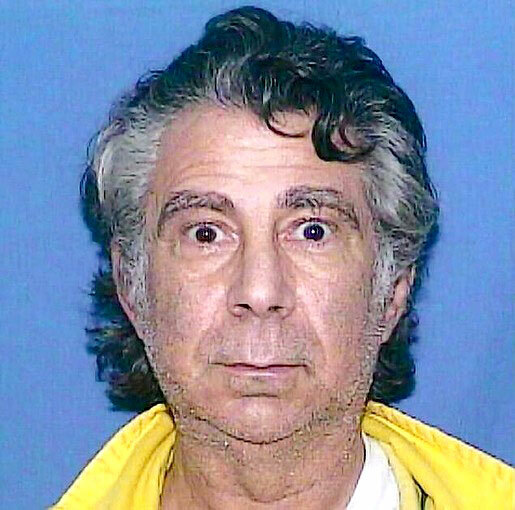 Zabrin was first arrested and convicted in 1992, after pleading guilty to selling $800,000 worth of reproduction “limited edition” prints. One year after his supervised release ended in 1998, he was back at it. According the the grand-jury indictment, from July, 1999 to October, 2007, he and fellow associates, Oswaldo Aulestia-Bach, Elio Bonfiglioli, Patrizia Soliani, and Jerome Bengis, conspired to produce and sell these reproduction prints through various outlets, including eBay and dealers in Florida, New York and Australia. According to the Chicago Tribune, the fake artwork was sold throughout the world in prestigious galleries in Paris, Tokyo, and Barcelona, for example. Of course, Zabrin included his home state of Illinois, with galleries on Michigan Ave. in Chicago. Now he’s been sentenced to nine years in prison. That should cool his heels for a while. He’ll be 67 when released, if he serves the full term. One would hope that he will have learned his lesson by that time, but some people seem to have larceny in their genes, so I’m not optimistic. Hopefully, the fear of being imprisoned again will keep him on the straight and narrow. Leon Amiel, Jr., 39, on right. Photo courtesy Chicago Tribune. 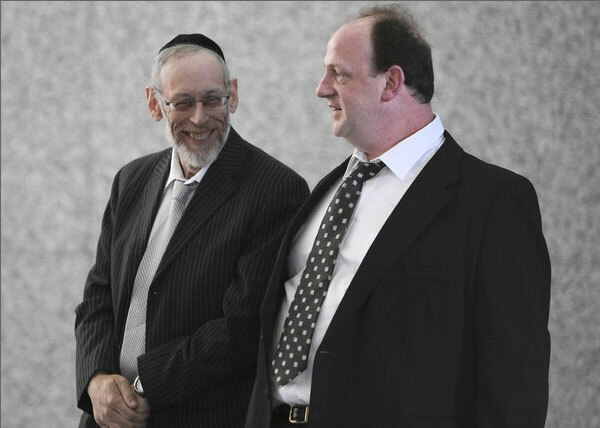 James Kennedy and Leon Amiel, Jr., were associates of Zabrin’s in the fake art schemes. On June 15th, U.S. District Judge Joan Gottschall sentenced Amiel to two years in prison for his part. He faced a possible six years, but the judge was lenient, citing “his commitment to family as well as mental problems and a family history of emotional and physical abuse.” Kennedy is due for sentencing this month, after which federal officials will destroy 20,000 fakes. Those that have already been sold will continue to be a problem for years to come. 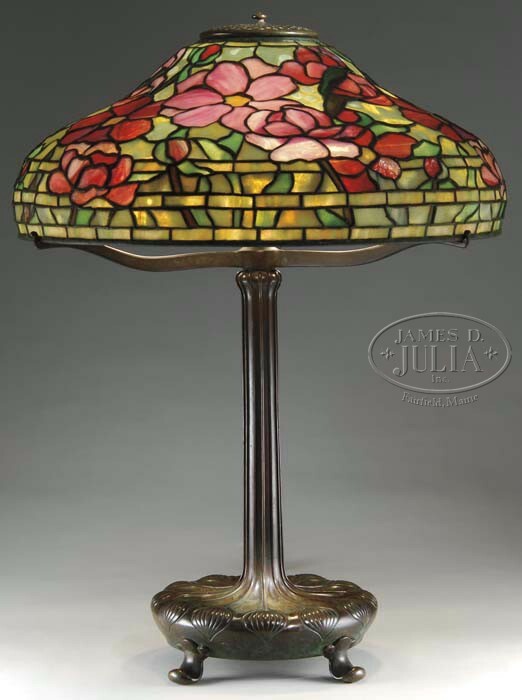 James D. Julia, Inc. held its Important Lamp & Glass Auction sale on June 23-24, 2011. 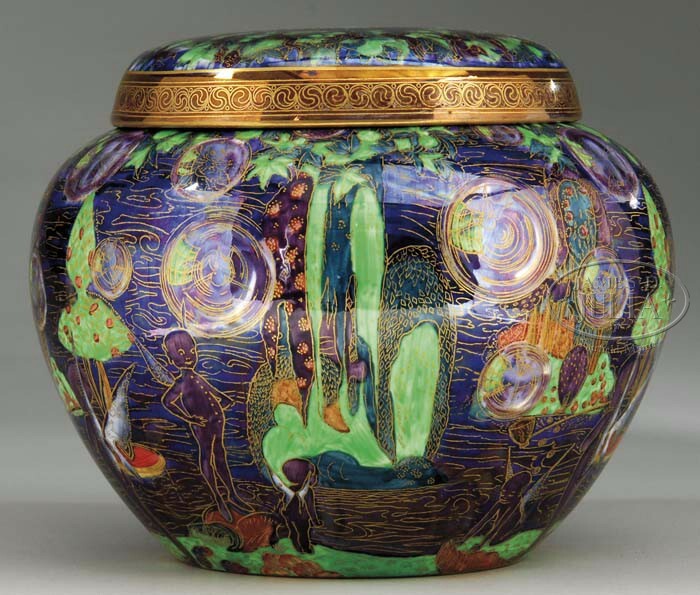 Sale coordinator, Dudley Browne, was generally pleased with the results, especially for the Tiffany Studios and Wedgwood Fairyland Lustre items. 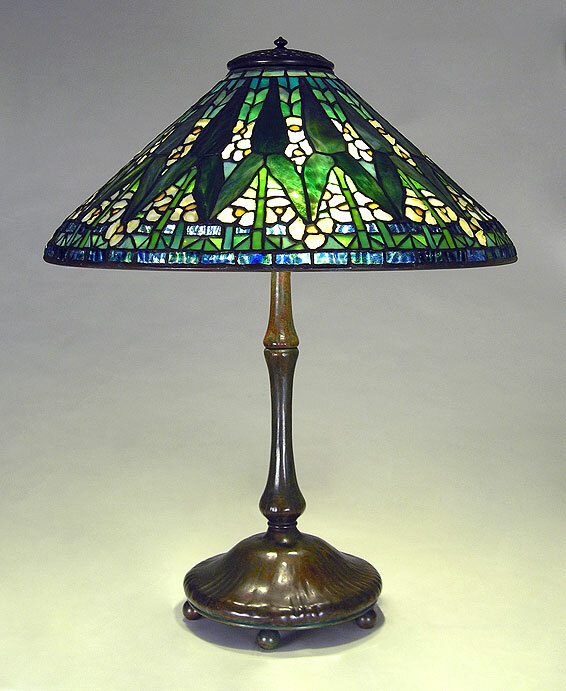 Leading the Tiffany Studios items was an 18″ Peony table lamp, lot #1248. Estimated to sell for $85,000 – $100,000, it sold within the estimate for $94,875, including buyer’s premium. 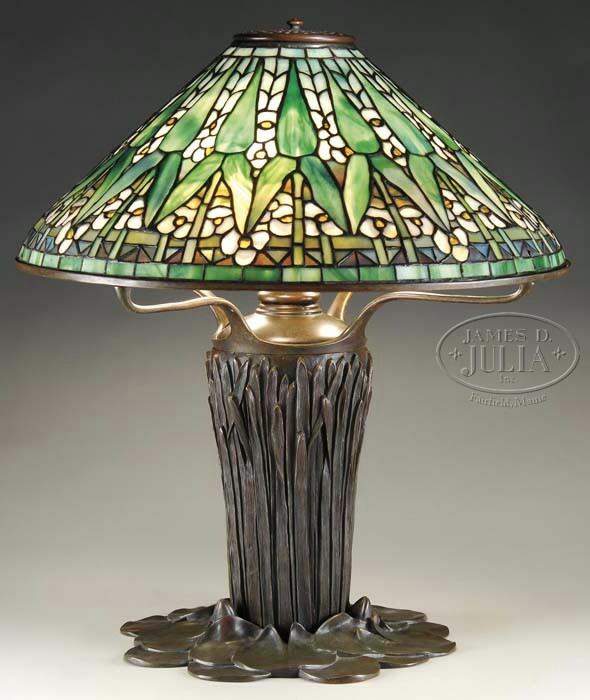 A Tiffany Studios 20″ Arrowroot table lamp on an important cattail base, lot #1224, was the second highest grossing lamp. It realized $92,000, against a pre-sale estimate of $80,000 – $100,000, also within the estimate. 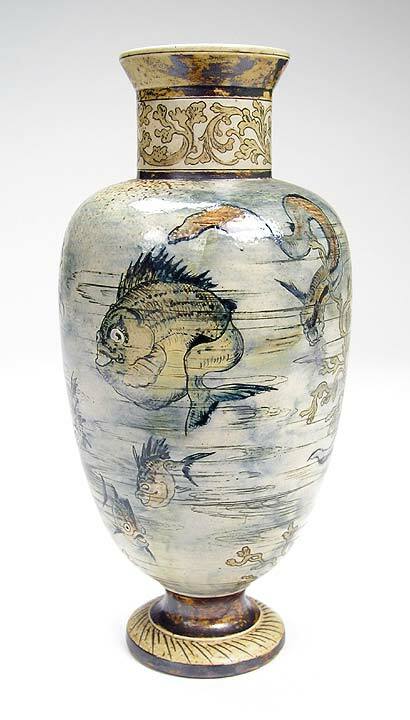 Wedgwood Fairyland Lustre items did well, with a malfrey pot in the Bubbles II pattern selling for $33,925, against a pre-sale estimate of $25,000 – $30,000 — near the high estimate. 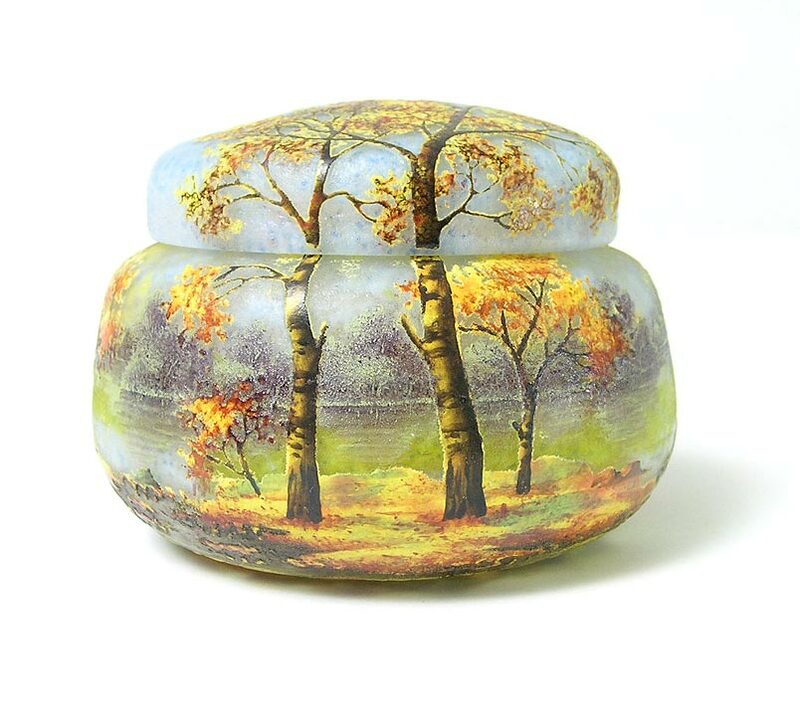 Sales of Wedgwood Fairyland Lustre items at auction over the last few years have been on a roller coaster ride. A few years ago, they were riding high, only to fall in more recent auctions. They were hot again this auction, with bidding coming from many telephone bidders, as well as the audience in attendance. French glass was softer than usual for a Julia’s auction. Results had been reliably strong for years. A Gallé floral table lamp with red roses led the group with a final price of $19,550, against an estimate of $16,000 – $20,000. For the complete results, click on the following link. Julia’s Lamp & Glass results. You have to sign in first to see the results. Registration is free.